Get early access to the upcoming PowerApps functionalities by joining PowerApps Preview Program. Each environment is created under an Azure AD tenant, and its resources can only be accessed by users within that tenant. An environment is also bound to a geographic location, like the US. When you create an app in an environment, that app is routed to only datacenters in that geographic location. Any items that you create in that environment (including connections, gateways, flows using Microsoft Flow, and more) are also bound to their environment’s location. Every environment can have zero or one Common Data Service databases, which provides storage for your apps. The ability to create a database for your environment will depend on the license you purchase for PowerApps and your permission within that environment. For more information, see Pricing info. When you create an app in an environment, that app is only permitted to connect to the data sources that are also deployed in that same environment, including connections, gateways, flows, and Common Data Service databases. For example, let’s consider a scenario where you have created two environments named ‘Test’ and ‘Dev’ and created a Common Data Service database in each of the environments. If you create an app in the ‘Test’ environment, it will only be permitted to connect to the ‘Test’ database, it won't be able to connect to the ‘Dev’ database. There is also a process to move resources between environments. For more information, see Migrate resources. Set data loss prevention policies. For more information see Data loss prevention policies. After creating the database in the environment, you can use System Administrator role instead of Environment Admin role. 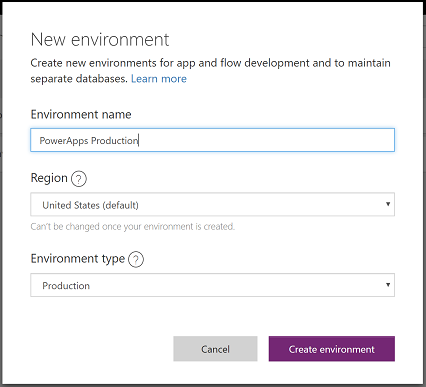 The Environment Maker role can create resources within an environment including apps, connections, custom connectors, gateways, and flows using Microsoft Flow. Environment Makers can also distribute the apps they build in an environment to other users in your organization by sharing the app with individual users, security groups, or to all users in the organization. For more information, see Share an app in PowerApps. Users or groups assigned to these environment roles are not automatically given access to the environment’s database (if it exists) and must be given access separately by a Database owner. For more information, see Configure database security. Users or security groups can be assigned to either of these two roles by an Environment Admin from the PowerApps Admin center. For more information, see Administer environments in PowerApps. A single default environment is automatically created by PowerApps for each tenant and shared by all users in that tenant. Whenever a new user signs up for PowerApps, they are automatically added to the Maker role of the default environment. The default environment is created in the closest region to the default region of the AAD tenant. No users will be added to the Environment Admin role of the default environment automatically. For more informaton, see Administer environments in PowerApps. You can create environments for different purpose. A Trial environment is for trying out the environment and database with Common Data Service experience. It expires after certain period. For more information, see Administer environments in PowerApps. With the introduction of environments, you will now see a new experience when you come to https://web.powerapps.com. The apps, connections, and other items that are visible in the site will now be filtered based on the current environment that is selected. Your current environment is specified in the environment picker near the right edge of the header. To choose a different environment, click or tap the picker, and a list of available environments appears. Click or tap the one you wish to enter. You are a member of the Environment Admin role for the environment. You are a member of the Environment Maker role for the environment. You are not an Environment Admin or Environment Maker of the environment, but you have been given ‘Contributor’ access to at least one app within the environment. For more information, see share an app. In this case, you will not be able to create apps in this environment. You will only be able to modify the existing apps that have been shared with you. Your license determines whether you can create environments. Where can environments be created? You will be able to create new environments from PowerApps.com and from the PowerApps Admin center. If you create an environment, you will automatically be added to the Environment Admin role for that environment. There is not be a limit on the number of environments that you can participate in as a member of the Environment Admin or Environment Maker role. For more information about environments, see Administer environments in PowerApps. For instructions on how to create an environment, see Create an environment. Add or remove a user or group from either the Environment Admin or Environment Maker role. For more information, see Administer environments in PowerApps. Provision a Common Data Service database for the environment. For more information, see Create a Common Data Service database. Set Data Loss Prevention policies. For more information, see Data loss prevention policies. Set database security policies (as open or restricted by database roles). For more information, see Configure database security. Members of the Azure AD tenant Global administrator role (includes Office 365 Global admins) can also manage all environments that have been created in their tenant and set tenant-wide policies from the PowerApps Admin center.